The old M7 tanks were designed at the end of the 19th century. They were steam locos and built for hauling passenger trains in south west London. They were an immediate success and 110 locos of the type were built between the first in 1897 and 1911. But they became utterly redundant from that job as lines were electrified and they migrated to other areas to haul local passenger trains on branch lines. They survived a very long time. The last M7 loco was withdrawn from service in 1965. 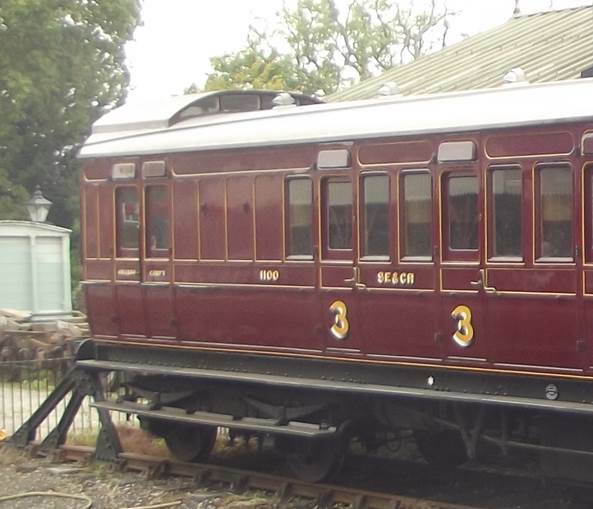 Two of the class have been preserved. 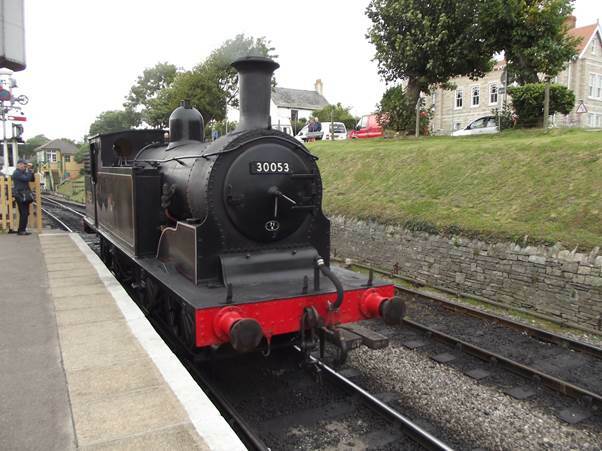 One of them is based on the Swanage Railway and is still in regular service. 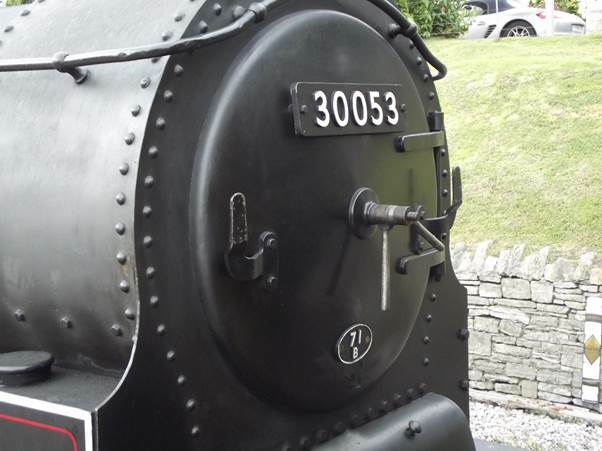 When built, in 1905, she was number 53 of the London and South Western Railway. But much to my delight she is running in the form and colour I knew in the early 1960s – so she is number 30053 of British Railways. 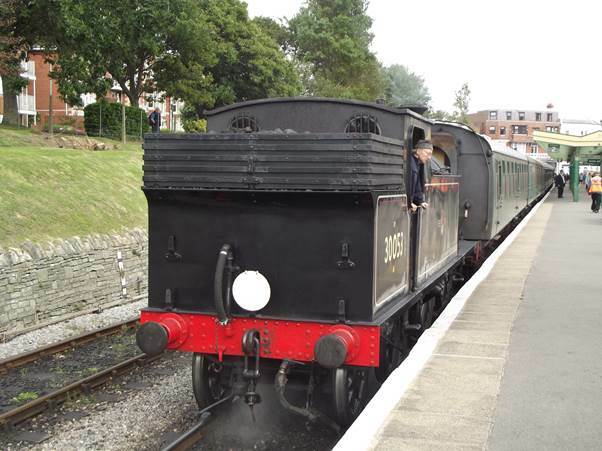 Here she is shunting down onto the train at Swanage. Tank engines were designed to run either way round equally well, but they still look better with the boiler leading. Once attached to the train we see her bunker first. 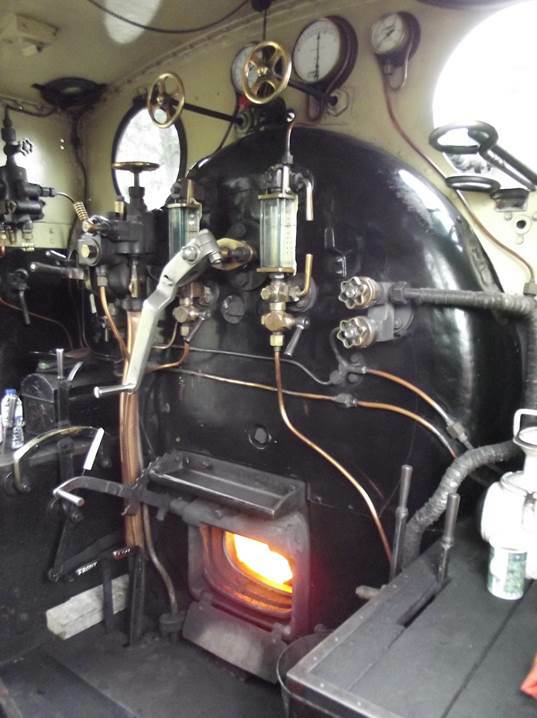 Like any working steam loco she has a fierce fire burning under the boiler. Here’s the front end again. Here we see the loco number and another little plate which says 71B. 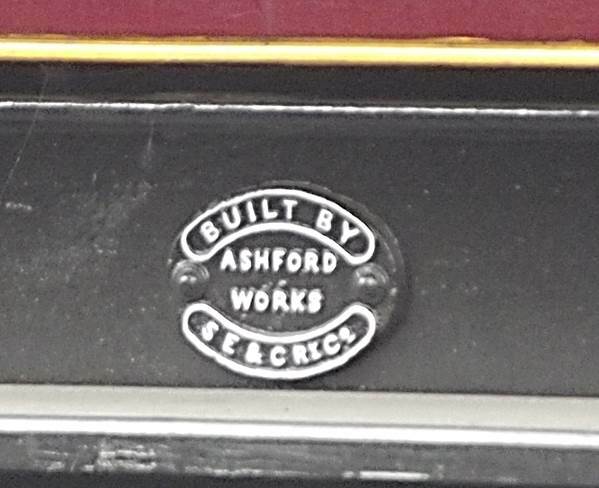 That little plate was called the shed plate and the 71B was code for a depot where the loco was based. In this case it means Bournemouth which is where locos on the Swanage branch would have been looked after. Now to be a true train spotter for a while. We can see I had deemed it important enough to fork out half a crown on this publication – and here’s a bit of one page in the book. First of all 30053 is underlined which meant I had seen it. And the shed it was allocated to was 75E. Time to look at another page in the book. This shows us the codes for sheds and names them. 75E was Three Bridges which was my most local shed. It is also underlined which means I had visited that shed. 30053 was one of my home engines when I was a spotter. I have a feeling it was usually at the sub shed at Horsham and worked trains between Horsham and Guildford. I feel privileged that I can still enjoy seeing this old friend hauling trains. Mid to North Wales is almost crowded out with steam railways of the narrow gauge variety. 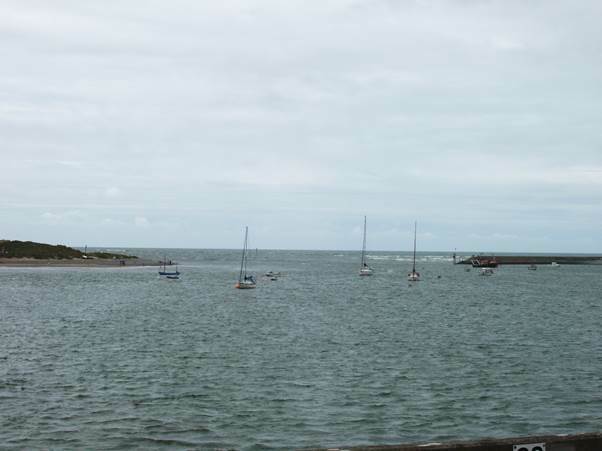 One that might be easy to miss is the miniature line at Fairbourne. 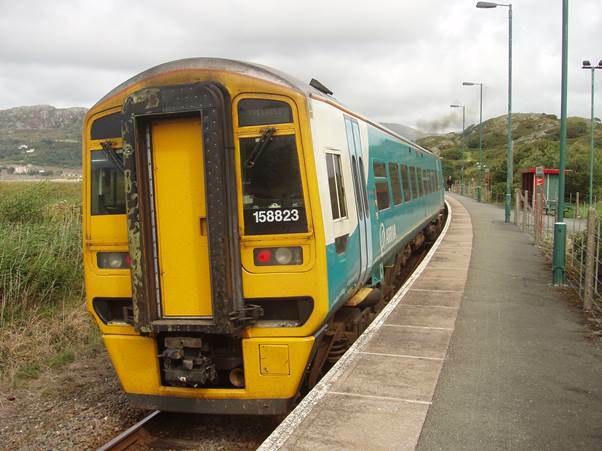 Fairbourne has a mainline station on the Cambrian Coast Line. 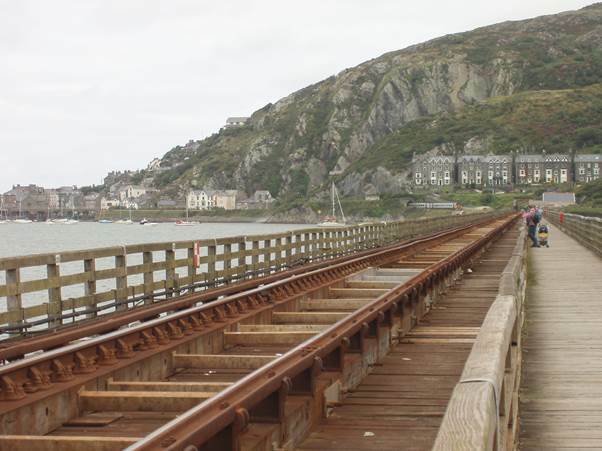 In a bid to develop tourism the potential resort of Fairbourne was built, reaching away from the main railway and down to the sea front. A tramway was built to help build the village and that became the Fairbourne Railway. Originally it was built to a two foot gauge but has been progressively narrowed and now the two rails are just 12½ inches apart. It makes a pretty sight as the little train trundles between Fairbourne and a point on the Mawddach estuary a couple or so kilometres away. 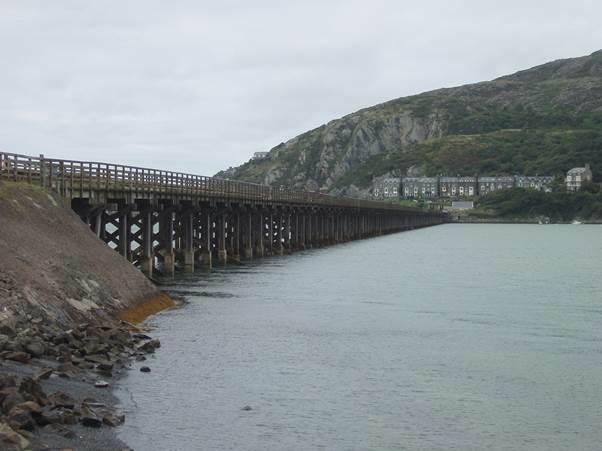 Small ferries can link with the train to take passengers across the estuary to Barmouth. We chanced upon a train when we visited in August 2015. 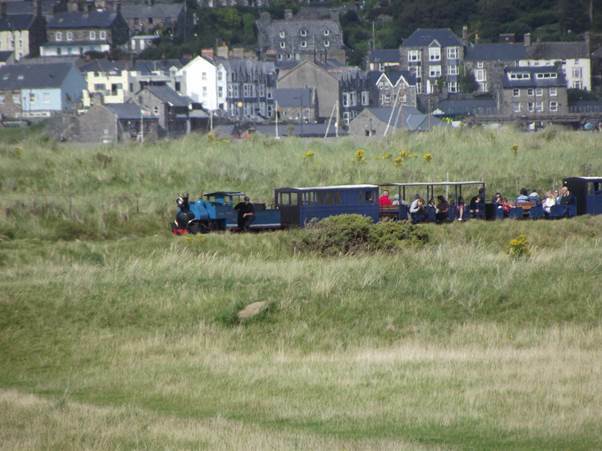 There’s the train, with Barmouth in the background, as she makes her way from the ferry station towards Fairbourne. The little loco, Sherpa, hauls its load past us. 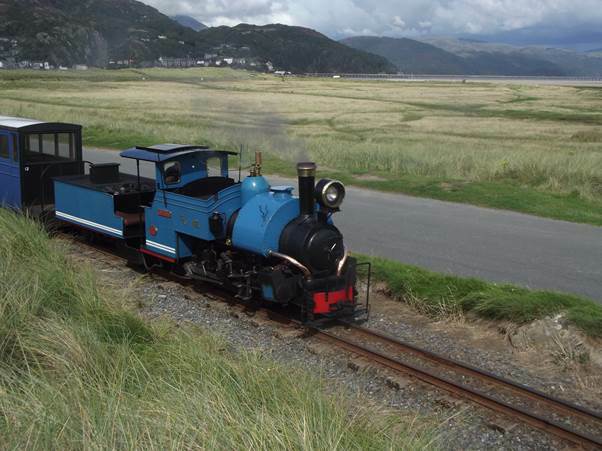 She leads her train onwards, towards Fairbourne. Meanwhile, back at Fairbourne, the loco Yeo was being readied for the next journey. If you are like me, any time you come across the words Sunlight Soap you’ll begin to hum or sing alternative words to a well-known Christmas Carol – While shepherds watched. And they began to scrub. But never mind that. 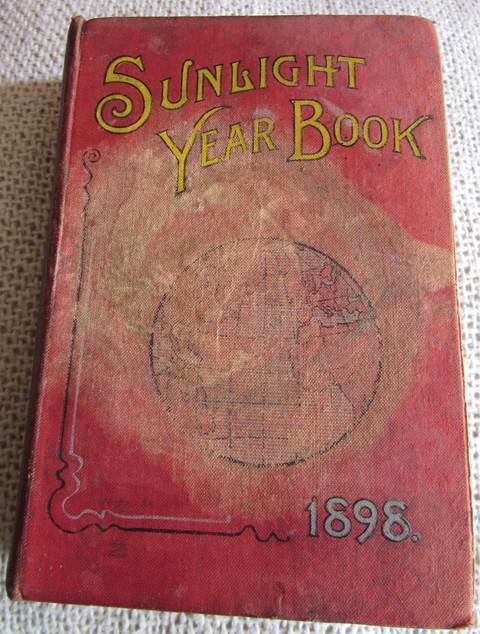 Let’s look at my Sunlight Year Book for 1898. Yes, it has suffered some damage. I wonder if somebody found it a handy place to put down a hot saucepan. Inside you’ll find everything you might want to know. This includes a full list of all the members of parliament and all sorts of other things. I’ve picked on some of the line drawings to give a feel. For those folks of 1898 keen on keeping cattle there was advice and numerous drawings of different breeds. Keeping on an agricultural theme you could discover what crops were grown in Britain. You could learn about the latest fashions. Or how to read a gas meter. Your maids could discover how to do the washing. How splendid! There is even some information about railways. Just for the record, regular trains from Newport to Paddington take about 1 hour 57 minutes these days. That’s an average 0f 73.5 miles per hour. Kings Cross to Newark is more impressive at 1 hour and 13 minutes these days or about 98 MPH! Now I think that book is lovely. I hope you do too. A couple of days ago I wrote about the Rye and Camber tramway and my dad’s visit to it and commented that it was still possible to be hauled by a loco a bit like the one that hauled him. Actually, I was way off in my thoughts, for his loco, back in 1930, had been petrol engine whereas the one I was thinking of is actually electric. 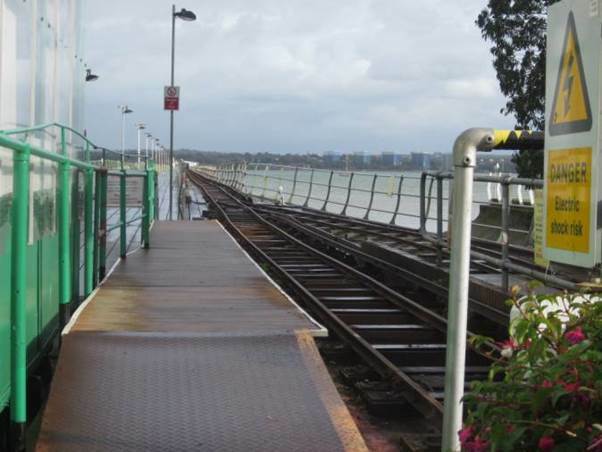 It runs along Hythe pier which extends out into Southampton Water from the village of Hythe. There’s the pier and railway and here’s the loco. It’s actually quite a small neat little thing and clearly has a substantial train which it will soon propel back to the pier head where it connects with the ferry for Southampton. The pier railway has been running since 1922. Piers need repair and this service out to the pier head was carrying some timber to keep the pier in good order. This was on a small truck attached to the train by a long metal pole. And here it goes (click here to see the train move off). Photos and video date from October 2012. Morfa Mawddach is a railway station in west Wales. Let’s try to get the pronunciation first. 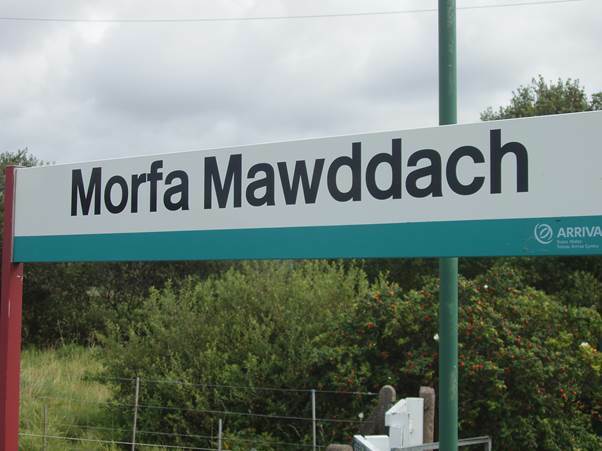 Morfa is pronounced ‘more var’ Mawddach starts off as mou as in mouse. Then has a th sound as in ‘the’ and ends ack. English speakers can find Welsh hard! But being able to pronounce it properly matters. The station is a request stop. If you are on a train and wish to alight at this station you have to ask the guard. I remember our first attempt when we asked the guard if he’d make sure the train stopped for us at ‘More fur more datch’. He claimed not to know the place. I suspect he was teasing us but taught us how to say it. We took our children camping close by this station three times in the 1980s. Back then it still had something of the former grandeur of an important junction station. 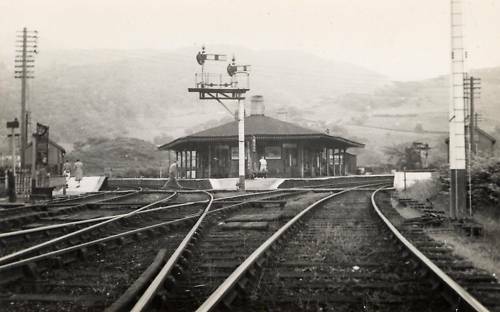 Once upon a time it had been known as Barmouth Junction and looked like this. By 2006 when we revisited it was a single, rather windswept and desolate platform. Scenically this is a marvellous place. 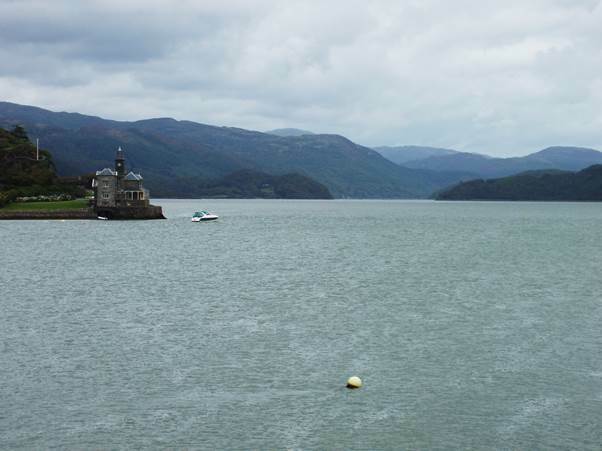 It is just south of the Mawddach estuary and Barmouth lies across the other side. A long bridge enables trains to cross and it has a footpath alongside it. In 2006 we walked across. 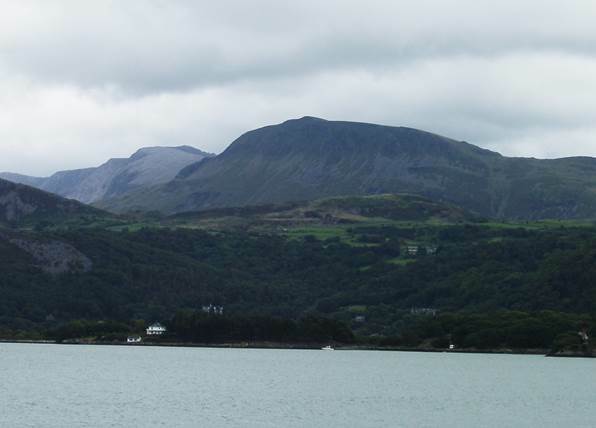 The estuary is fantastic and the southern side is dominated by the brooding hulk of Cader Idris. The bridge itself is a wonderful bit of engineering. And this shows the view to Morfa Mawddach. There’s a view out to sea as well. It’s a great train journey, of course. There are miles and miles of spectacular scenery from, say Machynlleth in the Dovey valley right through to Pwllheli on the Lleyn peninsula. Last year, when we visited the Isle of Wight Steam railway it was a wonderful day and a grand experience. But I did comment on one thing that I regrette3d and that was that the railway issued modern tickets. I commented that it probably made book keeping easier since the computer, somewhere, kept all records. But I fell, that for me, one part of the heritage experience was missed. 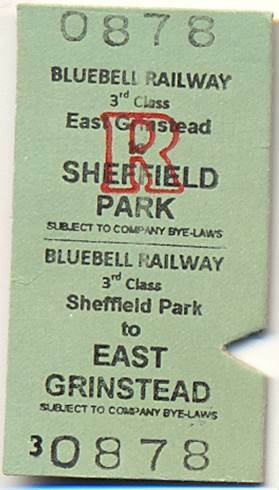 At the Bluebell Railway, last month, that little snip of memory was rekindled properly as the Bluebell issue good old fashioned Edmonson tickets. Yes that looks the part. It’s a proper railway ticket with serial number. A clerk should record the first and last serial number of the day and then compare it with takings in the till. He should be able to tally his results and show he hasn’t been fiddling the books. When Thomas Edmonson evolved this system, back in the 1840s, it was a huge step forward in the accounting process. Before that, all tickets had been individually written. But we can sympathise with the Isle of Wight Line for it still involves much adding up and checking. 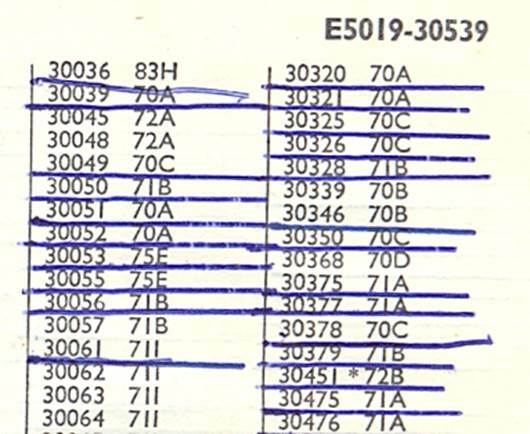 The thing that I remember most about the issuing of these tickets was a double clunk noise as the ticket was pushed both ways into the date stamping machine. That noise is just so evocative of the start of a train journey and what a pleasure it was to hear it at Sheffield Park Station. The date appears on the reverse of the ticket. This date allows any ticket inspector to see that the ticket is valid for the journey you are making. The Edmonson ticket had other advantages. The card was robust enough for the clipping process. A triangular notch was removed from this card as I left the booking hall and went on to the platform. 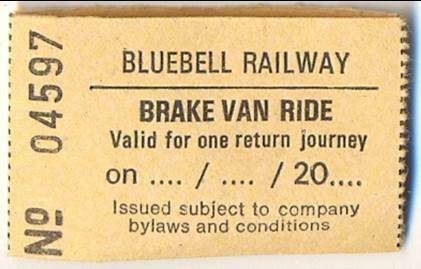 In a sense, this doesn’t matter on the Bluebell, for the ticket, which looks like a standard return from Sheffield Park to East Grinstead, is in fact a day rover. You can travel back and forth as many times as you like. But again, the clipping was a part of the experience. If the ticket had been a ‘real’ return ticket that triangular notch could tell a ticket inspector I had already made the journey and was riding a train fraudulently. And again, the clipping had a sound – one I associate with railway travel. It’s good to bring back those memories. Because we took the absolutely magical brake van ride at Horsted Keynes, we got another ticket. 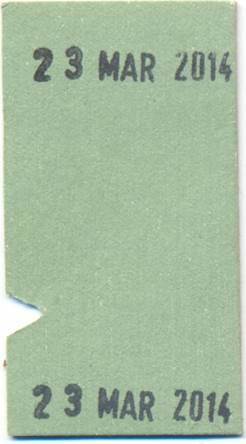 This one is not an Edmonson – it was more like a bus ticket. The date has not been entered but it was the same date – 23rd March 2014. Of course, both tickets have been added to my collection. Both help to keep memories alive for me.